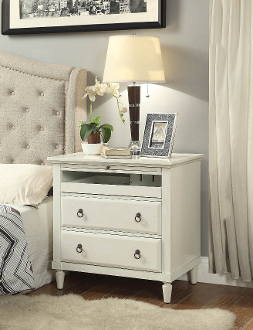 The Madison Nightstand with Charging Station in Antique White is a versatile piece of furniture. It features a slide out drawer that contains a hidden charging station so you can charge your electronics by your bedside within arms reach or hidden. Also, it features 2 storage drawers for your other items as well as a pull out drawer for writing. The charging station contains 1 power outlets and 2 USB ports located within a hidden compartment of the table. Dimensions: 28"W X 18"D X 28"H. Assembly is required.